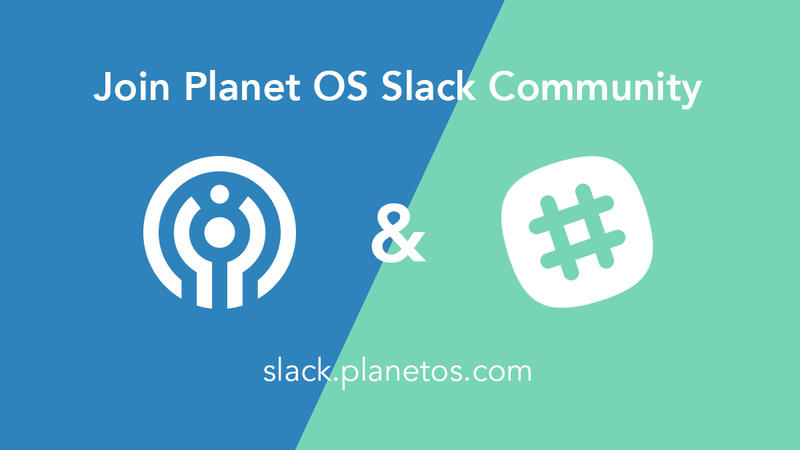 This guide provides an overview of the key features and concepts of Planet OS. The summary section provides key metadata attributes for the dataset. Each of these attributes is explained in further detail below. The party from whom the dataset was acquired. The specific method of production of the original data. If the product was model-generated, source should name the model and its version. If the dataset is observational, source should characterize the empirical method (e.g. surface observation, radiosonde, etc.). A short, descriptive summary of the dataset. The time at which Planet OS last acquired new data from the dataset publisher. The frequency at which data is updated at its origin (e.g. hourly, daily, monthly). The general method by which data is produced (e.g. observed, modeled, hindcast, reanalysis). Scientific feature type or CDM data type (e.g. GRID, RADIAL, SWATH, IMAGE, ANY_POINT, POINT, PROFILE, SECTION, STATION, STATION_PROFILE, TRAJECTORY). The spatial reference system used by the dataset (e.g. WGS84). The temporal resolution of the data in time units or free text. The spatial resolution of the data in meters, decimal degrees or free text. The extent section describes the spatial and temporal extent of the dataset. The minimum and maximum latitude and longitude are expressed as decimal degrees. For datasets with a vertical extent, this information is also included. The start and end date of the available data are provided as well. Datasets that are actively producing new data are denoted as "Ongoing". The variables section includes information about all dataset variables, including the variable name, long name, and unit. The total number of variables is shown in parenteses immediately after the section title. At the right of the section header is the vocabulary used for the variables. Typically this is a CF (Climate and Forecast) convention, and includes the specific version of the vocabulary is also included when available. 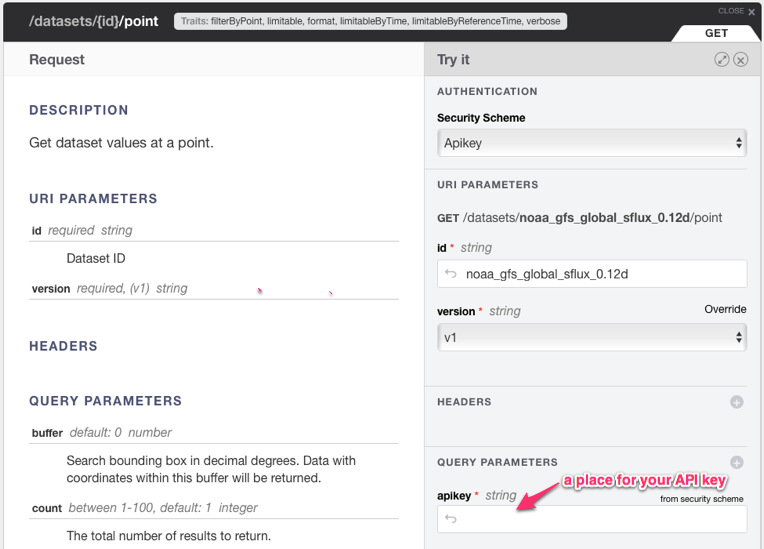 When performing API queries, the variable name shown in this section may be used to request specific variables. The dimensions of the dataset are displayed separately in this section. Typically this includes dimensions such as time, reference time, latitude and longitude. When provided by the publisher, the dataset's license is included here for reference. Planet OS provides a variety of interfaces for accessing data. Details regarding the available data access methods and protocols, as well as rate and volume limiting are discussed below. 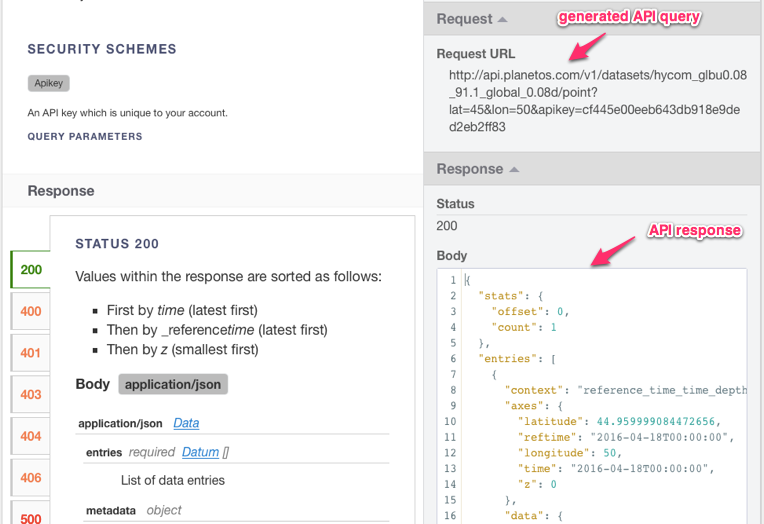 Planet OS provides a RESTful API for programmatically accessing data at specific locations. Documentation and resources for this API are included below. Data access is limited by both call rate and transfer volume per user. For details on individual plans, see our pricing page. Free accounts are limited to 100 REST API calls per day and 5 GB of data transfer per month. If your workflow or application requires access that exceeds these limits, please contact datahub@intertrust.com. The Planet OS REST API can be used to integrate disparate spatiotemporal datasets into data-driven applications and workflows. The API provides programmatic access to data at a specific location and delivers JSON responses. Each Planet OS user is granted a unique API key that is used to authenticate API calls. All API endpoints require this key be passed as a query parameter to authenticate the request. Your key may be viewed on the Account Settings screen and is provided below if you're currently logged in. Matches on the standard name of any variable in the dataset. Standard names are from the NetCDF-CF standard name table. To search for multiple standard names, they should be comma-separated. Quoted expressions will be treated as a single standard name. E.g., `variable.standard_name=time,"air temperature"` will match datasets that contain variables with standard names matching `time` or `air temperature`. Partial matching is supported via usage of `*` wildcard. E.g., `variable.standard_name="*wind*"` will match datasets containing variables with standard names containing `wind`. The response includes a count of matches, a list of matched datasets (results) with dataset IDs (key) and a set of metadata attributes. Dataset search is enhanced with additional faced-based filtering. To take advantage of it, please use these API endpoints which list all possible facet values. Table of matching search parameters. A list of facets key value tuple pairs. The key is for making API queries, while value might be used as a human-friendly facet representation for UIs, data visualizations, etc. Get list of all dataset IDs. A flat list where each item is a plain text dataset ID. Title: The title or name of the dataset. Abstract: A short summary of the dataset. Publisher: The party from whom the dataset was acquired. Institution: The party who created the dataset. Source: The method of production of the original data. If it was model-generated, source should name the model and its version, as specifically as could be useful. If it is observational, source should characterize it (e.g., 'surface observation' or 'radiosonde'). ProductType: Method how data is being produced — observed, modeled, hindcast, reanalysis, etc. More generic than the "Source"
Provides values for the specified dataset at a given point of interest. Points are expressed using longitude and latitude coordinates in decimal degrees. Latitude in decimal degrees. North latitude is positive. Longitude in decimal degrees. East longitude is positive. Altitude/depth axis. Is not defined by specific unit, instead allows to select "first", "last" or "all" altitude/depth data "layers"
Name of the specific variable obtained via metadata query. Format the response as comma separated values (CSV). Search bounding box in decimal degrees. Data with coordinates within this buffer will be returned. If multiple axes contexts are provided for a dataset, use context to limit which are returned. Multiple contexts can be passed using comma separation. All available contexts are returned by default. More details are in the Contexts API. The total number of results (data samples) to return. Single sample is identified by unique LonLat coordinate and timestamp. Variables from a single sample can be split into contexts. Offset the returned results by a specific count. Sets a lower time boundary for dataset values. Return values at or after this timestamp in ISO 8601 format: YYYY-MM-DDTHH:MM:SSZ. Sets an upper time boundary for dataset values. Return values at or before this timestamp in ISO 8601 format: YYYY-MM-DDTHH:MM:SSZ. Orders samples in the API output by "time" dimension. If true, return data only from the point nearest the requested latitude and longitude. By default, this value is true and the nearest point is returned, however if a buffer value is passed, nearest will default to false. Return values at or before this reference timestamp in ISO 8601 format: YYYY-MM-DDTHH:MM:SSZ. If true, returns the full forecast duration using values from the latest available reference time (e.g. most recent). If a partial forecast exists due to processing delays, values from the previous reference time are also included. If either reftime_start or reftime_end values are passed, reftime_recent will default to false. Return values at or after this reference timestamp in ISO 8601 format: YYYY-MM-DDTHH:MM:SSZ. If true, display global metadata. If true, display entry metadata. If true, display entry lineage. If true, display all available metadata. Response format is documented in a separate section — Data Values Output Format. Provides values for the specified dataset at a given area of interest. Area-based query output is a grid of Points which are expressed using longitude and latitude coordinates in decimal degrees. Query parameters of /area endpoint are the same as for /point endpoint, except the lon and lat coordinates. Instead, /area uses polygon parameter. Polygon defined by the list of Longitude-Latitude pairs. # number of rows of values in data array should be the same as the number of values in the first "index axis"
# number of values in row #n should be the same as the number of values in the second "index axis"
// number of rows of values in data array should be the same as the number of values in the first "index axis"
// number of values in row #n should be the same as the number of values in the second "index axis"
An experimental feature of /area API endpoint. Allows to retrieve all values from the provided polygon and a single timestamp in one request without pagination. A new experimental area-specific query parameter grouping renders the output of the single API sample as an array of arrays covering the whole dimension like LonLat. The output of location-based grouping has additional attribute — indexAxes. It contains a list of tuples (pairs) of dimension name and dimension coordinates values. Group data values into a single sample using provided dimension. The only supported dimension, for now, is "location." Get the list of stations within a dataset. Note that not all datasets contain stations. A JSON object where every key inside station structure is station identifier. Station attributes like TemporalExtentStart, TemporalExtentEnd, SpatialExtent indicating spatial and temporal bounds of time-series data originated from the station. Get values for a station. Note that not all datasets contain stations. Accepts the same query parameters as the /point endpoint. Response format is similar to the /point endpoint. Get the list of contexts (groups) of dataset's variables. Contexts of variables sounds like something abstract, but in simple terms, context is a group of variables sharing same dimension space. Some datasets would have only single context, that means that all variables share the very same dimensions. Some datasets contain variables on different altitudes, so every combination of XYZ+time dimension would get its own context. Lon+Lat+Elevation-10m+Time and Lon+Lat+Elevation-90m+Time are pretty typical groups, sort of layers on different altitudes. A JSON list of objects where every object represents a single context. Contexts are machine-generated so they might look cryptic, that's why each context has details about dimensions it covers. variableKeys — contains all variables grouped in the context. dimensionKeys — contains names of variables that define dimensions. referenceSystem.scopes — contains suggestion for dimension interpretations, like "scopeType": "axis_t" gives a hint that particular dimension is related to time axis. Here is a list of scope types supported right now: location, axis_t, axis_z, axis_radial_distance, reference_time, node, classifier, instance, iter. The most valuable scope types are the ones representing common dimensions location, axis_t, axis_z, reference_time, the rest are auxilary. Request a list of all available variables from particular dataset. A very simple query to list all available variables from a particular dataset. Each variable has a variableKey for API requests and human-friendly long_name attribute in the list of attributes. Request a list of all available timestamps from particular dataset and provided variable. A very simple query to list all available timestamps for particular dataset and variable. Timestamps are in "epoch milliseconds." Request a data sample from particular dataset and variable covering full spatial resolution of the dataset for a single timestamp. Return an object with X/Y (Longitude/Lattitude) arrays and a two-dimensional array of data values for the provided combination of dataset ID and, its variable and timestamp. Attributes to plot the data: lon for the X axis, lat for the Y axis, each row in the values array corresponds to a single value of lon and every item in every row corresponds to a value of lat. Data sampling request enables selection of particular timestamp. By default system automatically selects latest available timestamp. Let's start with an API output example for the GFS forecast by taking one variable Temperature_hybrid from the list of 200+ variables. Use of single variable will make the example more readable. Root elements are stats and entries. Stats just describes user's query. Usually, it duplicates query parameters (like count and start/end), but in case user omits the use of some query parameters this section shows defaults that were used. Entries section is a list of data samples selected by API query. In the example above we use default count setting which is 1. So we have a single entry. 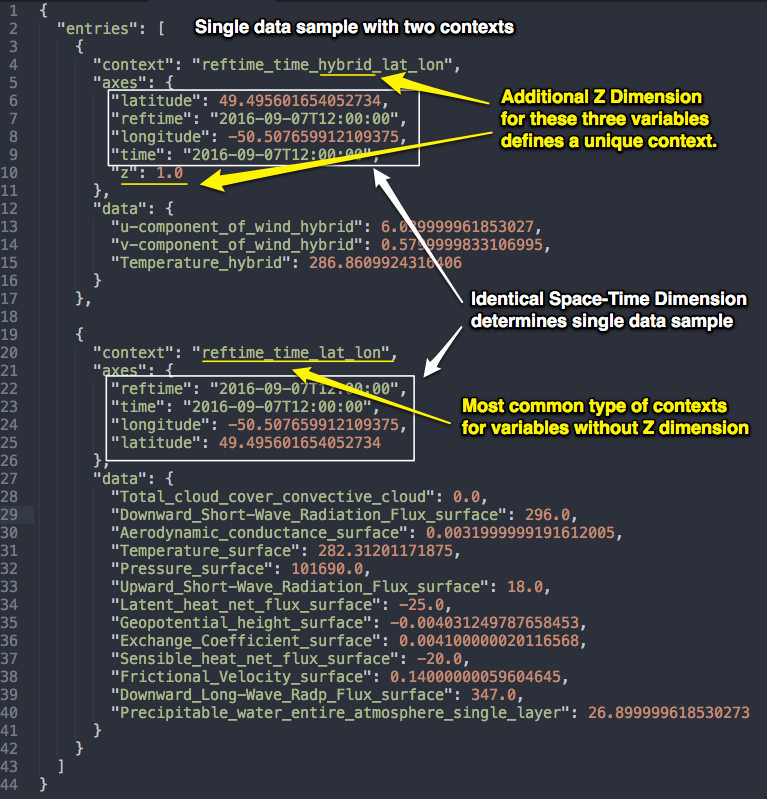 Every entry has assigned XY, optionally Z and two timestamp coordinates as a part of axes object. It is easy to notice that reftime is always same as time for observational datasets, unlike GFS in our example, which is forecast. So reftime dimension is only useful for forecasts and some modelled datasets, where timestamp of dataset entry creation is different from the timestamp that dataset entry is describing. Data section of every entry may contain more than one variable. It is possible to query all variables from any dataset by just omitting var parameter. Please take into account that variables are grouped by context. For more details about Contexts see the Contexts API. Here is an example of annotated data sample. A set of experimental API endpoints for packaging larger data requests in binary form (zipped NetCDF files) and asynchronously fetching them for offline workflow. Request a list of previously submitted user's packages. A very simple query to list all of the previously submitted packages. The output contains a plain list of package IDs, which could be used to check each package status and download if a package is successfully generated. Submit area-based package creation request for bulk data download. Query parameters of package creation API could be copied directly from the /area query. It is designed for the cases where synchronous /area query takes too long (for larger time spans or hi-res datasets). Custom package ID. Instead of using auto generated UUIDs, it's possible to supply custom unique identifier for your package. The output contains confirmation object with packageKey attribute, which can be used to poll packages creation status and download packaged data when it's ready. Request package status by its ID. An endpoint for querying submitted package creation status. The output contains object that contains confirmation that package is in processing queue or successfully generated. The main attribute for package generation completion is packageResult.success. An endpoint for fetching zipped NetCDF files by package ID. API Console provides simple UI for building API query interactively. It has short descriptions of query parameters and output JSON schema. If the user enters his personal API key into an appropriate query field, API Console allows to execute that query and see results. API rate limits are dependent on your current plan. Free accounts are limited to 100 calls per day. If you'd like to request a rate limit increase, please contact datahub@intertrust.com with more information on your needs. By using the Planet OS REST API, you agree to our terms of service. Please take a moment to review the terms. Datasets delivered via Planet OS data access interfaces may be subject to third party licenses that govern acceptable end-uses of the data. If you are unsure of a dataset's license or restrictions, we encourage you to contact the data publisher directly for clarification. Planet OS reserves the right to suspend or terminate accounts that violate our policies. If you're a mindful and considerate developer, this shouldn't be an issue for you. We've published a collection of Jupyter notebooks on GitHub that provide API use case examples in Python. The notebooks are well-annotated so you can learn as you step through the commands. The repository includes details on how to install Jupyter and the required Python modules, as well as tips to get you started. 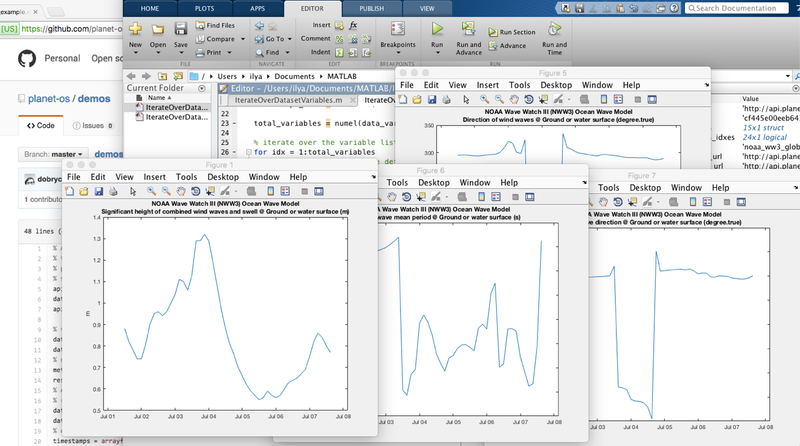 We've published a point API example for Matlab and are looking for additional use cases and examples. If you're a Matlab user who's interested in providing code samples utilizing the Planet OS API, let's collaborate! Contact us for more information. Feedback, support requests, and other inquiries may be directed to datahub@intertrust.com.